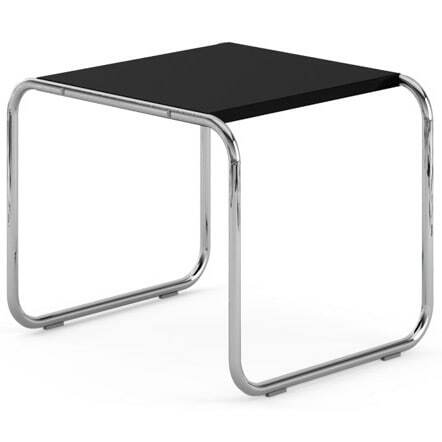 Small side table Laccio, the Bauhaus design classic by Marcel Breuer. Marcel Breuer designed the low Laccio table 1925 as a companion of the legendary Wassily chair and created, at that time as a Bauhaus student, a timeless design classic that still enjoys worldwide popularity. The tubular steel classic Laccio, suitable as a coffee table or a side table, was the first table from Breuer designs, which was based on the tubular steel frame of a bicycle. Today Laccio is available in 3 versions: In the version offered here with a table top made of laminate and also with table tops in marble or - brand new - lacquered table top. Knoll International manufactures the Laccio table to original specifications by Marcel Breuer in 2 different sizes. The small, square Laccio table is due to its dimensions of 55cmx48cm already very well used as a side table, for example as a small table next to the reading chair or at the lounge area. The square Breuer Laccio table 1 is with a height of 45cm also suitable as a small square coffee table. The second table, Knoll International manufactures according to the original Marcel Breuer ​​sketches, is the narrow rectangular coffee table Laccio 2 with a height of 34cm and a length of 136cm, which can be perfectly used as a coffee table. Marcel Breuer's rectangular Laccio table makes also a good figure in the lounge area, for example in the hotel foyer. An ingenious design draft as Marcel Breuer's Laccio table will naturally have imitators. If you want to be sure to buy an original, pay attention to the Knoll Studio logo and the signature of Marcel Breuer, which are embossed into the table frame. Do you have a question about "Laccio (laminate)"? How can we contact you?